There are plenty of great things at North Greenville University, but sometimes we tend to take them for granted. We asked a few students which things around campus they take for granted and why they appreciate these simple, yet important parts of our university. Whether you are standing outside or sitting by a window, you are bound to catch yourself gazing at a beautiful mountain view. The area surrounding North Greenville University is a simple, yet stunning reminder of just how great God is. "It's great waking up every morning and seeing the mountains. On the way back to my dorm every afternoon I get to see the colorful sunsets that fill the whole sky." If you have never spent time in Todd Prayer Chapel you are missing out on a serious blessing. Complete with waterfall and gorgeous stained glass, it is the perfect place to get away and spend some time with the Lord. "It's a beautiful, peaceful place to worship and it's open 24/7." What's not to love about the stud? There are comfy chairs to lounge in. There is food and friends all gathered in one area. It is an ideal place to take a break from all your stressful assignments and that one suite mate you can not quite get along with. The stud is a relaxed environment, ideal for social interaction and study time combined. "I like to study here because I get to be around other people." There is something to be said about a place where professors start class with prayer. When it is this close to finals and nerves are on edge, it is especially comforting to start class by having a conversation with God. 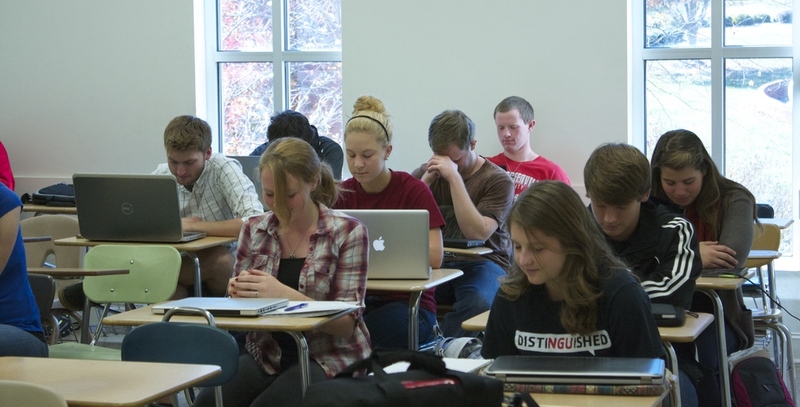 "Prayer in class is great because I feel like class can be used for God's glory. All the work we do is for the glory of God, but only with God's help can we accomplish everything we have to get done." NGU is a small town within a small town. Whether you are walking around campus or participating in a club or organization, you can always expect to find a welcoming smile and a "Hey, how are you?" "Everyone, no matter who you talk to, is really nice. It's almost like a family."